The number of holes on the sink for the faucet or faucets determines a lot of things like the function of the sink and the availability of hot and warm waters. Usually two faucets that share one sink is a lot more convenient than having a sink with only one faucet. However there are times when people are stuck with a sink having only one faucet and they have to at least make it work. With only one faucet, this means that both hot and cold waters will be passing through the same faucet. This also means that it takes time to have hot water flowing out if you just used cold water and vice versa. If there are two separate knobs for the hot and cold water then mixing the temperature won’t be the problem but I always had the problem of figuring out how to mix the temperature and get the perfect mixture of hot and cold water. Even when a single faucet cannot function as efficient as the multiple faucets, as long as the faucet is durable and functioning well, then it will surely serve its purpose. 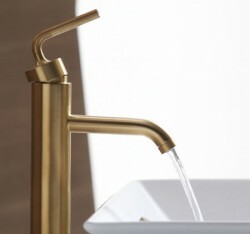 A good durable faucet as I used to think, may depend on the brand however, it all starts with proper installation. No matter how famous the faucet’s brand may be, if it is not installed properly then don’t expect it to work as well as they would say on infomercials. I don’t really like plumbing. But in the long run I have learned that the only way to avoid repairing plumbing –related problems is to do the plumb work once and do it properly. The rest of the preventions come with the proper use of the faucet and sink. Ehow.com has a step by step guide on how to install the faucet properly. Like in all plumbing projects, the very first step is to turn off the main switch of the water source. It would be difficult to install the faucet on a wet surface. The steps will also depend if you are installing a new faucet on a sink with an existing faucet or if both the sink and the faucet are new. Remember to clean out the dirt and rust that the previous faucet left on the sink. A dirty surface is just as worse as a wet one so don’t install the faucet if these conditions apply. After cleaning out, the next step is to connect the hoses that goes through the hole on the sink and continues on to the faucet. Remember to connect the right types of hoses for the hot and cold waters. Secure every section using a nut and wrench. Before the final step, try turning on the water and check for leaks. To further secure the connections, I recommend using a silicone caulk around the edges. Also, try to practice mixing the hot and cold waters and determine how long it takes before the change in temperature occurs. Knowing this helps you to use your faucet properly and prevent future plumbing repairs I personally hate doing.